The annual recognition program sets new benchmarks for storytelling, news reporting and editorial leadership among content providers and shines a spotlight on the exceptional art directors and designers who complete the editorial package. 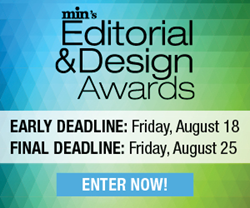 min is now accepting submissions for its annual Editorial and Design Awards, a program which recognizes excellence in content and design across the magazine media industry. Past winners of this prestigious awards program have included People Magazine, Harper’s Bazaar, Refinery29, Harvard Business Review and other renowned companies. For more information, visit: http://www.minonline.com/go/2017-editorial-and-design-awards/. min’s Editorial & Design Awards is open to all publishers of content—magazines, websites, association publications, content marketing publications, social media communities, or digital-only brands. The early deadline to enter is Friday, August 18 with a final deadline of Friday, August 25.